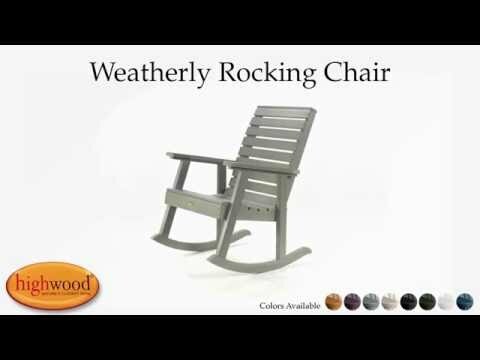 Explore the entire highwood® product line to coordinate other beautiful and durable products to enhance your outdoor living space. Best of all, our material doesn’t absorb moisture and repels dirt and grime, making clean-up a breeze. The rocking chair has been load tested, per ASTM 1561-03 (2008) standard for Outdoor plastic furniture, and has a 500-pound weight capacity. Some assembly is required (see assembly guide) and assembled chair =27"W x 44"H x 32"D (33lbs). Easy assembly. Looks like real wood. Two years ago we purchased the matching porch swing and it still looks new. Our porch looks very welcoming with these items. These are the best outdoor chairs we’ve ever owned, and we use them all the time… I will soon be ordering more chairs and tables for a patio down by the bay.